The Basilica of the National Shrine of the Immaculate Conception is finally complete. Construction of the massive church was finally completed on December 8, 2017, nearly a full century after building first began. The Basilica of the National Shrine of the Immaculate Conception, also called the Trinity Dome, is now the largest Catholic Church in North America. 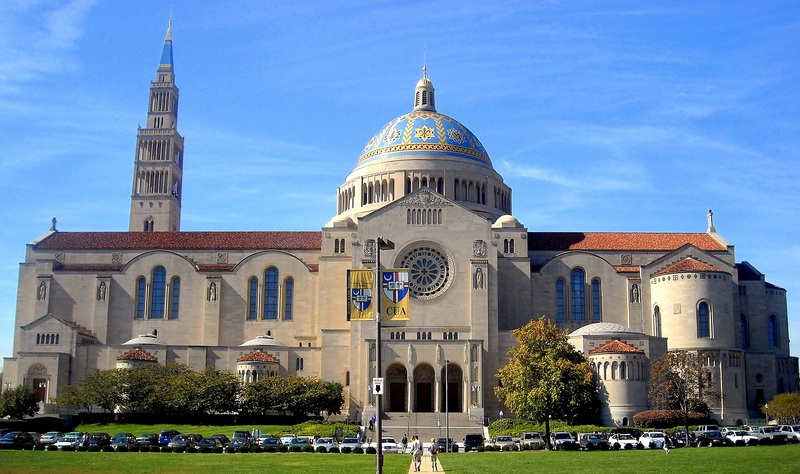 The church is located in Washington, D.C. next to the Catholic University of America. Even before the church was completed, the National Shrine was visited by nearly one million people every year. Many of these people were undoubtedly there to see the mosaic that decorates the ceiling of the Trinity Dome. The enormous masterpiece is the largest of its kind and is comprised of more than 14 million individual pieces of glass. The artwork depicts the Holy Trinity, the Virgin Mary, the four evangelists and a procession of angels. A number of saints are depicted as well, several of whom are important to the United States. The first canonized Native Americans, St. Juan Diego and St. Kateri Tekakwitha, are represented as well as the first American citizen to be canonized, St. Francis Cabrini, M.S.C. St. Junipero Serra, whose canonization was the first to take place on American soil, also appears in the design. The Nicene Creed is written out in the mosaic as well. The Trinity Dome’s incredible artwork was a challenge to create for Viggo and Martin Rambusch, the artistic designers of the Basilica of the National Shrine of the Immaculate Conception’s now famous mosaic. The dome is a deeper curve than others in the basilica which made for unique opportunities and challenges when the Rambusch’s designed the mosaic. The Trinity Dome’s icon scheme was patterned after the Basilica of St. Mark in Venice with the ceiling area of the shrine meant to be a succession of decorated domes. In addition to the elaborately mosaiced Trinity Dome, the Basilica of the National Shrine of the Immaculate Conception is home to over 80 chapels and oratories that honor the Virgin Mary. The mammoth church is one of the ten largest churches in the world and has been described as a “hymn in stone.” Now that the church is complete, Barcelona’s Basilica i Temple Expiatori de la Sagrada Familia is now the largest unfinished Catholic church. As for the National Shrine, the church is looking forward to celebrating its upcoming 100th anniversary two short years from now, the first anniversary where the church is truly complete.